Betty Banana: “Betty Banana, in her yellow cape / Suffers a fate she cannot escape. / A modest fruit, as everyone knows, / She is not happy when stripped of her clothes.” Two years ago, artist Fritz Scholder and writer Jeannette Eyerly began a unique collaboration, the first result of which was their very successful book, An Alphabet Book for Adults. We are pleased to announce their second publication together, Food for Thought. Every bit as entertaining and thought-provoking as the first, this follow-up title takes on fruits and vegetables. Eyerly and Scholder display not only the depths of the talents for which they are so well known; their mutual love of cooking, eating and celebrating food is obvious as well. 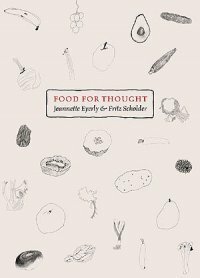 Food for Thought comprises poems by Eyerly and drawings by Scholder for 25 fruits and vegetables, from the lowly potato (“Patrick”) to the floweretted fennel (“Fanny”). Jeannette Eyerly is widely known for her many popular young adult novels and the challenges of growing up. Fritz Scholder is the subject of several films and over twenty books. His paintings, drawings, lithographs and sculpture are represented in major collections throughout the world.